Please join LanaLou's for a wonderful time celebrating music and friendship. Some tasty appetizers will be served all night and head up to the bar for some Rum & Eggnog.Doors: 7 PM. Cover: $10 or admission free with a non perishable food bank donation. 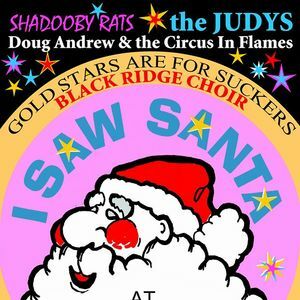 All proceeds will be going to the Vancouver Food Bank.Band Set Times:Black Ridge Choir 8:00Preston & Fletcher 8:30The Circus In Flames 9:00Shadooby Rats 9:30The Judy's 10:00Gold Star's Are For Suckers 10:30Mrs. Claus & her Drunken Elves 11:00Sunday, December 11, 2016 - LanaLou's Rock & Roll Eatery, 362 Powell St. Vancouver, B.C. V6A 1G4. Ph: 604-563-5055.